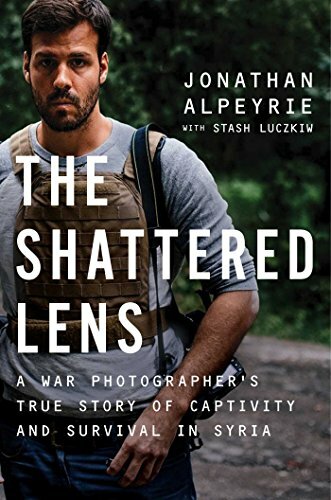 As a veteran combat photojournalist, Jonathan Alpeyrie confesses in this memoir that he relates to both motivations mentioned above. He had captured the tortures of war in dozens of conflicts for over 10 years but he never expected to become the center of headlines himself. In order to capture realistic photographs for his assignment, it was necessary for him to enter the Syrian combat zone. As he crosses the border from Lebanon with various handlers or “fixers” leading the way guarding and driving strangers suddenly appear with AK-47s near a checkpoint. As the guards slowly began to trust Alpeyrie, they allowed him some freedoms, and the treatment became a bit more humane. He is allowed to watch television with one of the captors and small talk becomes more frequent. He even teaches one of them to swim. But what now? One of the advantages that is used as a bargaining chip by Alpeyrie, is that he is a French American born in Paris. He is eventually taken to meet with a man named Abhoud who lives in a manor behind a large gate. Jonathan learns that his worth is $450,000. What they want is for Jonathan to relay to the French Government the name of the man who paid the ransom and that he may soon want a favor from the French. His painful ordeal soon draws to a close but not before he is told to share pertinent information via a debriefing at the French Embassy in Beirut. The Americans take their turn next as Author Alpeyrie holds dual citizenship. The Shattered Lens sometimes reads like a thriller. There are times your heart feels like it’s in your throat. It’s hard to imagine going through an ordeal so frightening and most of us can’t begin to contemplate working in a war zone. But it is photojournalists like Author Alpeyrie that give us a glimpse into the true horrors of war. And as they risk their lives every day to accomplish very dangerous tasks, they can be considered both courageous and brilliant by bringing the chaos to the world at large, which would otherwise be hidden. There is a slight conundrum in The Shattered Lens that may puzzle some readers. Author Alpeyrie adeptly chronicles the events both prior and after his captivity. He describes in copious detail the bloody battles and horror that occur all around him. Concomitantly being surrounded by death and mayhem while subsequently being kidnapped would create abject terror and uncontrollable panic in most people. In contrast during many portions of the book, his demeanor appears detached. He seems almost immune to the violence around him as well as displaying a state of calm while being shackled and held prisoner. Perhaps it is because as a photojournalist he is able to conquer his emotions in order to accurately report the facts in these hellish situations. It is also possible that he was simply in the midst of a traumatic event that caused his emotional valve to shut down. Nevertheless, his flat affect may appear quite eerie to some and to others mildly adiaphorous. But this does not diminish the fascinating subject matter nor his personal sacrifice to report the truth. Laura Schultz is a licensed psychotherapist (LMFT), life coach, and freelance writer. She has been a therapist for 25 years and has published in several national magazines. Her treatise, “Hiding in Plain Sight: The Psyche of Serial Killers” appears in Crime magazine and her article entitled “Strychnine and Stilettos: The Anatomy of Female Serial Killers and Their Victims” is due out in the November issue of Crime Spree magazine.